Apple has sent an emailed apology to customer affected by the recent iCloud outage that took down email for a small fraction of users for several days. Apple claimed the outage only affected 1.1% of iCloud users. We apologize for the mail service interruption you recently experienced. Your mail service has been restored and all emails sent during this service interruption have been delivered to your account. 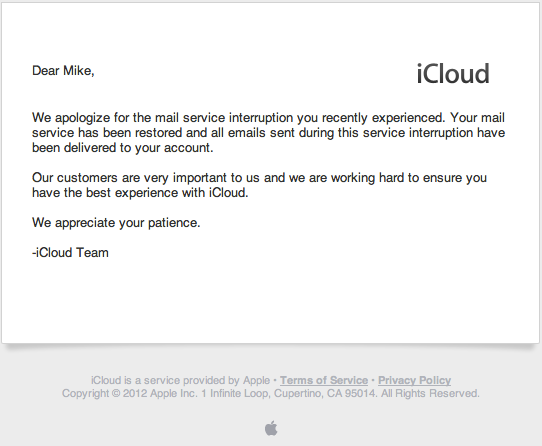 Our customers are very important to us and we are working hard to ensure you have the best experience with iCloud. Apple has not disclosed any plans to offer a service credit or refund to affected users, though compensation is slightly more tricky because the base iCloud service is now free. I was out for 2+ days. .mac is my primary email address,I can't believe the amount of business that was lost because of this. I need more than an apology. A 2 day outage is unacceptable from Apple, no question. But if you really have business riding on this, you should have your own domain and be paying for email hosting. Since you're using a free-bee email account, you don't deserve and you aren't going to get more than an apology. I will stick to gmail i think! Steve would've never allowed this. Steve would have never sent an apology email and after public outcry would say that users don't NEED to access their email 24/7. Seriously. Glad Apple sent this email. Oh my God, really! If you lost business, because a free email service was down for a couple of days, then you really need to look into getting a commercial email service. I'm apparently in the 1.1% of iCloud users that were affected and did not receive an emailed apology for the 2+ day outage. I'm feeling like a special snowflake. I'm curious. What, exactly, do you feel you "need"? 24/7? Did you read the original post? Although I was not affected by the outage, if I had been I would have maybe settled for 24/6. Many people got 24/5 or less. As in at least two days out of seven without any email access. In 2012, any Internet service being out for several days, free or not, is inexcusable. a free service being down is inexcusable never. They apologise and you scream "I want free stuff" like the typical middle aged single mom trying to sue to pants off everyone for as much as breathing on her own property. This kind of outage really scares me away from using iCloud as my primary mail service. I use a few domains hosted through google/gmail and its rock solid, can be accessed on any type of device. I don't understand how someone relies on @mac/@me/@icloud for serious mail use. HEAR HEAR! Seriously. "Apple, pay me for my absolutely horrible lack of serious planning!". You may think Apple owes your business something, but frankly your own customers deserve a smarter vendor.